Remember the nineteen eighties? At the beginning of the decade, the only serious amplification came in two boxes. Whether it was Naim, Meridian, Exposure or Quad, you’d have to buy one marked ‘pre’ and another marked ‘power’. Then, in 1984, Naim Audio stunned the hi-fi world with a new ‘entry-level’ integrated. Selling for £235, the NAIT cost far more than any other specialist product of its type, and promised more too. The idea was that by going back to one box, costs could be cut without forsaking quality too much. And it worked, too. Despite its diminutive dimensions and miserly rated power output, the baby Naim proved a big hit and spawned a host of imitators. By the mid eighties, a host of ‘specialist’ British amplifier manufacturers had their own products. NVA’s AP30 was possibly the most extreme, a spartan design with just an input selector, volume control and on-off switch (on the rear panel, naturally). Exposure’s X was another serious NAIT rival, offering considerably more power and a more muscular sound that sacrificed some of the NVA’s subtlety. However, the NAIT’s nemesis came from Essex’s Canvey Island, in the unlovely shape of Inca Tech’s Claymore. From a little known company, this £345 amp relied entirely on its superb sonics to gain a foothold in the fast-growing ‘super integrated’ market. By today’s standards, fit and finish are poor. The chassis and casing are roughly pressed aluminium with a crackle black finish (what else!) on the top and front panel. By the standards of its minimalist competition, the Claymore is a veritable riot of facilities. Two large black knobs take care of volume and input selection, while a couple of rough feeling push buttons offer tape monitoring and mute functions (pure luxury!). A clunky front panel on-off switch and headphone socket (on later versions) complete the package. Just as blue LEDs are currently de rigeur, in the eighties every black box had to sport tasteful gold lettering (“nice”), and this is no exception. Round the back you got RCA sockets for phono, CD, Aux and Tape sources – paltry by today’s standards but to see a CD input on 1985 amps was a revelation. From issue 2 onwards, the amplifier’s underside sported a MM-MC phono gain selector, and there was also a vestigial balance control pot (thankfully devoid of a knob). If all this is ‘nightmare on amplifier street’, then the inside provides welcome relief. The Claymore wins back cool points with a high quality ALPS volume pot, beefy ELNA power supply smoothing capacitors and a muscular toroidal transformer. Circuit layout is clean and relatively simple, and even if it doesn’t look as beautifully laid out as its Naim rival, you can tell a lot of effort has gone into this aspect of the Claymore’s design. Particularly impressive are the super-chunky wires running from the output transistors to the rear panel loudspeaker terminals. Plug it in and you get almost all the Naim NAIT’s grip and speed with stacks more grunt and finesse. Blending a quite sweet, smooth and big-hearted sound with real skin-of-the-teeth transient ability, this classic Colin Wonfor design actually sounds very modern and can comfortably see off many of today’s sub-£1,000 integrateds. Along with power aplenty, the Claymore can go loud (and quiet) very quickly, making it great at conveying rhythms. Better still though, it lacks the original NAIT’s ‘brightly lit’ upper midband, meaning that you use it with truly transparent loudspeakers without having to reach for the paracetemol. It’s a surprisingly refined and modern sounding design, but still does the business in terms of musicality and dynamics. And the icing on the cake is its superb sounding phono stage, built back in the day when black plastic was the only credible sound source. The good news is that you can pick Claymores up second-hand from £100, making them far better value than any other ‘super integrated’. Later on in life, the finish got a bit better and Inca Tech even did a gold plated version (selling for £645 in 1987), of which just six were made. If sound per pound is utmost, there are few eighties amplifiers that can touch the original Inca Tech. After a period out of the industry, nowadays Colin Wonfor has found a new home at Tellurium Q, whose Single Ended Class A amplifier has won many friends. Now, the company has announced the new Claymore, but at £3,760 it isn’t a direct spiritual successor and shares no common parts with the original. The classic Claymore, as we suppose it is now to be called, has something of a cult following and there is some information on the internet – audiochews is a good place to start. Some parts are hard to find now, but it’s still well worth the effort to keep this cute little classic going. Thanks for the link to audiochews. My Claymore has only just got a problem with the selector switch after 29 years service. Still sounds superb – grunt with finesse. I do believe Colin is still ‘on line’ at the Audiochews forum, at least he was a few years ago. I had a problem with … umm think it was output MOSFET or other power amp side output transistor. He sent me new upgrade parts FOC ! I too have had issues with the selector switch, easily changed, though the connecting ribbon cable is a little fiddly. True, the case was never the best fit, mine never sat square on table. 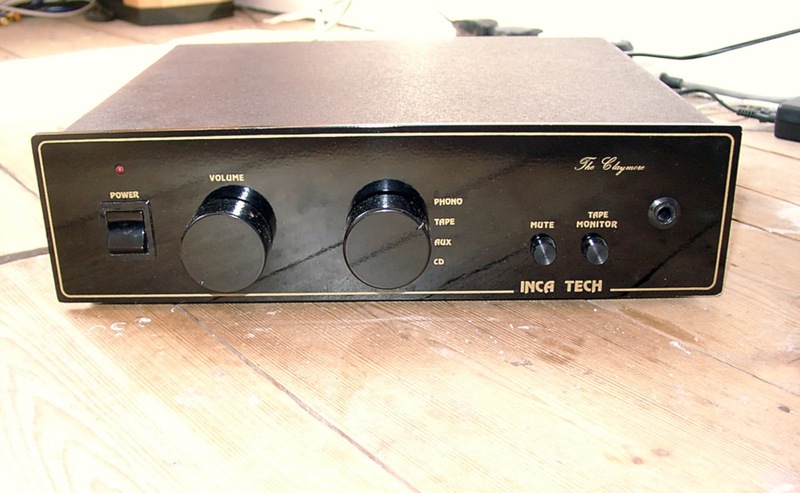 This was my first ever quality amplifier, bought as a student, from Rayleigh HiFi in Chelmsford. Oh BTW they also made the bigger Claymore II. too. I am now also do upgrades and repairs of the Inca Tech Claymore, and a new Claymore not from TQ.